For the third straight home game, Sky Blue FC came away with a win thanks to a late-game winning goal — this time from forward Maya Hayes as Sky Blue beat the Orlando Pride 2-1 in front of 3,451 fans at Yurcak Field. The Pride took the lead in the 18th minute on a goal from Jasmyne Spencer. Marta started the play at the top of the box and passed it back to Camila, who threaded it to Spencer for the score. 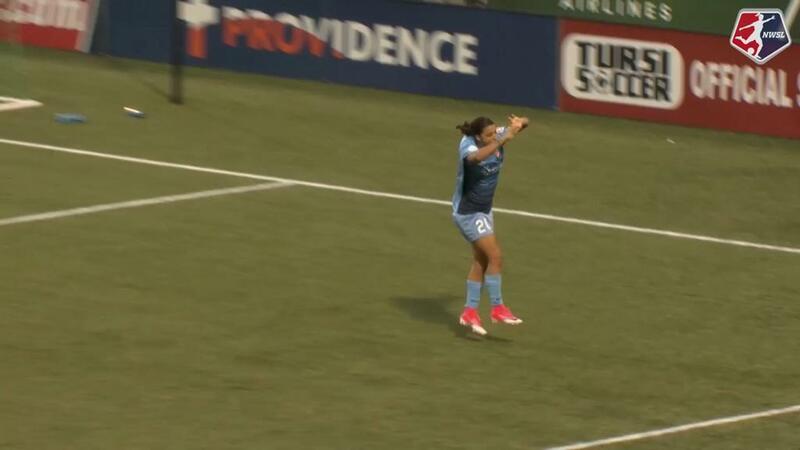 But Sky Blue equalized in the 43rd minute on a goal from forward Sam Kerr. Kerr assisted on the game-winning goal in the 82nd minute, jumping up for a header in the middle of the field after a goal kick from goalkeeper Kailen Sheridan. 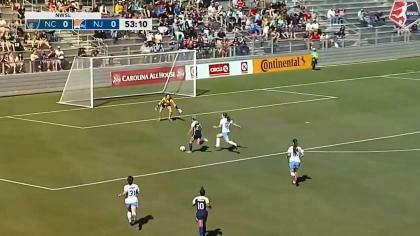 Hayes ran onto the end of the pass and sent it past goalkeeper Aubrey Bledsoe, starting in place of the injured Ashlyn Harris, for the game-winner. Match ends, Sky Blue 2, Orlando Pride 1. Second Half ends, Sky Blue 2, Orlando Pride 1. Attempt missed. Toni Pressley (Orlando Pride) left footed shot from more than 35 yards is just a bit too high. Assisted by Mônica. Foul by Ali Krieger (Orlando Pride). Attempt saved. Alanna Kennedy (Orlando Pride) header from the centre of the box is saved in the top left corner. Assisted by Marta with a cross. Jasmyne Spencer (Orlando Pride) wins a free kick on the left wing. Goal! Sky Blue 2, Orlando Pride 1. Maya Hayes (Sky Blue) right footed shot from the centre of the box to the bottom left corner. Assisted by Samantha Kerr with a through ball. Attempt missed. Jasmyne Spencer (Orlando Pride) right footed shot from the left side of the box is close, but misses to the right. Assisted by Marta. Attempt missed. Marta (Orlando Pride) left footed shot from outside the box is too high. Assisted by Aubrey Bledsoe. Attempt saved. Samantha Kerr (Sky Blue) right footed shot from the right side of the box is saved in the centre of the goal. Substitution, Orlando Pride. Danica Evans replaces Kristen Edmonds. Substitution, Sky Blue. Leah Galton replaces Madison Tiernan. Offside, Orlando Pride. Maddy Evans tries a through ball, but Kristen Edmonds is caught offside. Attempt saved. Toni Pressley (Orlando Pride) left footed shot from the left side of the six yard box is saved in the bottom left corner. Attempt saved. Alanna Kennedy (Orlando Pride) header from the centre of the box is saved in the bottom left corner. Assisted by Stephanie Catley with a cross. Attempt missed. Alanna Kennedy (Orlando Pride) header from very close range misses to the right. Assisted by Marta with a cross following a corner. Corner, Orlando Pride. Conceded by Sarah Killion. Attempt blocked. Camila (Orlando Pride) right footed shot from outside the box is blocked. Assisted by Ali Krieger. Substitution, Orlando Pride. Maddy Evans replaces Dani Weatherholt. Attempt saved. McKenzie Meehan (Sky Blue) header from the centre of the box is saved in the bottom left corner. Assisted by Kayla Mills. Madison Tiernan (Sky Blue) wins a free kick in the attacking half. Attempt saved. Maya Hayes (Sky Blue) right footed shot from the right side of the box is saved in the top right corner. Assisted by Samantha Kerr. Attempt saved. Kristen Edmonds (Orlando Pride) right footed shot from outside the box is saved in the centre of the goal. Substitution, Orlando Pride. Mônica replaces Jamia Fields. Raquel Rodríguez (Sky Blue) wins a free kick on the left wing. Substitution, Sky Blue. McKenzie Meehan replaces Daphne Corboz. Attempt missed. Jamia Fields (Orlando Pride) right footed shot from a difficult angle on the right is close, but misses to the left. Assisted by Marta. Stephanie Catley (Orlando Pride) wins a free kick in the defensive half. Substitution, Sky Blue. Kayla Mills replaces Erica Skroski because of an injury. Delay in match Erica Skroski (Sky Blue) because of an injury. Goal! Sky Blue 1, Orlando Pride 1. Samantha Kerr (Sky Blue) right footed shot from the centre of the box to the top left corner. Assisted by Daphne Corboz. Corner, Orlando Pride. Conceded by Erin Simon. Offside, Sky Blue. Daphne Corboz tries a through ball, but Maya Hayes is caught offside. Corner, Sky Blue. Conceded by Alanna Kennedy. Attempt blocked. Mandy Freeman (Sky Blue) right footed shot from the centre of the box is blocked. Corner, Sky Blue. Conceded by Ali Krieger. Attempt blocked. Maya Hayes (Sky Blue) right footed shot from the right side of the box is blocked. Assisted by Samantha Kerr with a through ball. Attempt missed. Raquel Rodríguez (Sky Blue) header from the centre of the box is close, but misses to the right. Assisted by Daphne Corboz with a cross following a corner. Attempt saved. Mandy Freeman (Sky Blue) right footed shot from the centre of the box is saved in the bottom left corner. Corner, Sky Blue. Conceded by Toni Pressley. Foul by Stephanie Catley (Orlando Pride). Goal! Sky Blue 0, Orlando Pride 1. Jasmyne Spencer (Orlando Pride) left footed shot from the centre of the box to the bottom left corner. Assisted by Camila. Offside, Orlando Pride. Kristen Edmonds tries a through ball, but Marta is caught offside. Attempt missed. Madison Tiernan (Sky Blue) left footed shot from the centre of the box is high and wide to the left. Assisted by Samantha Kerr. Attempt blocked. Stephanie Catley (Orlando Pride) left footed shot from outside the box is blocked. 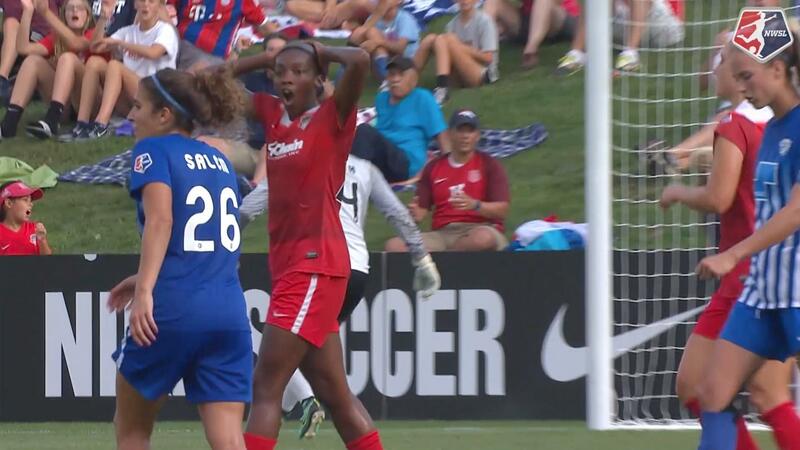 Foul by Jamia Fields (Orlando Pride). Corner, Orlando Pride. Conceded by Madison Tiernan. Jamia Fields (Orlando Pride) wins a free kick in the attacking half.